In the middle of Lewiston, Maine lies one of the poorest census districts in the state, one of the poorest in the country. Forty percent of the residents live at or below the poverty line. It is called the B Street neighborhood, encompassing the intersections of Birch, Bates and Bartlett streets. Within that neighborhood there is a place, a safe and sacred space, called Wisdom”s Center. Run by and for women, it brings hope and joy, life and light into the lives of women who otherwise fall between the cracks of the social service system. They are forgotten mothers, daughters, sisters and wives, many of whom are the most wounded of our society and have no support system elsewhere. Wisdom”s Center for those guests, is a sanctuary of sorts. It functions as as grassroots collaborative that offers women safe-haven and support to build community, find resources, build self esteem and resiliency. Women come together in solidarity to make their lives better. In doing so they can respond better to the stress of poverty, become more stable and improve their economic security. For nearly twenty years The Center has been a place of meaning and hope for marginalized women and is a treasured community resource. It strives to nurture all areas of healing – body, mind and spirit – and is working to become a trauma informed agency. While it places a focus on nurturing the inner spirit of women, it does so through deep listening and spiritual guidance when requested, in a non-sectarian way the honors all faith traditions and has no religious agenda. Through support groups and conversation, programs, activities and crafts, in a stress free environment, over tea and coffee (always on), lonely women became friends and learned that they are not alone. Some guests struggle with mental illness or abuse, others lost their children to state custody, many have health troubles or histories of substance abuse. Young women come as well as the elderly, many of whom lived alone. No matter what their life contains, every woman who enters is offered kindness and compassion, and is treated with dignity and respect. Some women listen, others speak, all are heard, deeply sharing the stories of their lives. 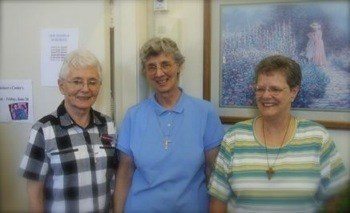 The Center was envisioned and started by Sisters Irene Arsenault, Mona Guerrette, and Maureen Hurley, of the order of The Daughters of Wisdom, a Roman Catholic Religious Community. Originally named Wisdom”s Center, it opened in 1999. The Sisters, along with Lady Wisdom, made a difference in the neighborhood, and in the lives of all the women they encountered. Their first year 98 women came. Over their nine years of operation, The Center reached 1000 women, logging over 22,000 visits. It became a valuable resource in the community, but in June 2008, the congregation found it necessary to discontinue the work. A group of volunteers and guests organized, raised funds and approached Trinity Church about fiscal sponsorship. The Center re-opened part time, with volunteer staffing that fall. In October 2009 we hired a Director and increased programming and operating hours. The Center for Wisdom”s Women maintains the wisdom charisma of the founding organization. The Daughters of Wisdom continue as one of our major funders. The Director is an Associate of the Daughters of Wisdom. 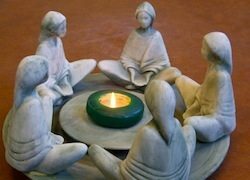 We are no longer associated with any particular religion or denomination, yet we do acknowledge and tend to the spirit of individual women through deep listening and spiritual guidance when requested, in an atmosphere that honors all faith traditions.